Singapore: Asian stocks were poised to end their first losing year in three on Friday, having shed nearly a fifth of their value as Europe’s debt crisis and financial turmoil took a toll on investors’ risk appetite, driving them to safer assets such as the US dollar and gold. Safe haven investments and cash are likely to remain in favour early in 2012 as investors closely monitor efforts to contain Europe’s debt crisis and the health of the Chinese economy, which may determine their return to risk. "The general outlook is that going into next year, there is going to be a lot of negative factors to watch from the European sovereign debt crisis. The market will remain very sensitive to the developments out of Europe in the beginning of the year," said Kenichi Hirano, operating officer at Tachibana Securities in Tokyo. “This year’s popular word was ’risk-off’ or investors shedding risk. Whether the market can switch back to taking on more risk and come back to equities remains to be seen, and the timing of that change will be in focus next year," he added. Japan specifically will benefit from the government spending to fund reconstruction after an earthquake devastated the country in March, he added. Reflecting the flight from riskier assets, US 10-year Treasuries gave investors a return of about 17% in 2011 with German Bunds returning 13% and gold around 10%. At the other end of the spectrum, copper fell nearly 23% on worries about cooling global demand and MSCI emerging equities tumbled some 18%. The MSCI index of stocks outside Japan is down more than 18% this year, while Australia’s S&P/ASX 200 index, shed 14.5%, recording its first back-to-back loss in 30 years and Japan’s Nikkei had a second straight annual drop, losing 17% in 2011. “If you look around at all the asset classes, it really has been a year of safe-haven flows, it is about preserving your capital and returning your equity," said Chris Weston, institutional dealer at IG Markets in Melbourne. Investors were spooked in 2011 by an earthquake and tsunami in Japan, which was followed by debt crises in the United States and Europe and floods in Thailand. On Friday, the mood was cautiously upbeat after US data on Thursday pointed to positive trends for the world’s biggest economy and triggered modest gains in US and European stocks. 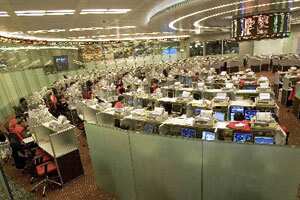 The MSCI ex-Japan index was nearly flat, while the Nikkei was up 0.7% on the day. Pending sales of existing US homes surged to a 1-1/2-year high in November and factory activity in the US Midwest grew more than expected in December. The euro was poised to end a roller-coaster year on a downbeat note, with its break below crucial technical support level boding ill for the year ahead. Over the past year the euro has shed more than 3% on the dollar, adding to a 6.6% decline in 2010. On Thursday it broke below support at this year’s low and sank to a 15-month low of $1.2858. It later recovered in Asia to $1.2940. Against the yen, the euro softened 0.2% to 100.37, nearing the 10-year low around 100.01 hit overnight. The US 10-year Treasury yield inched up in Asia on Friday but was on track for its biggest annual drop since 2008, yet another indicator of how the euro zone’s debt crisis has stoked safe haven demand. Commodities such as crude oil and gold fared better this year. Brent crude is set to end the year up nearly 14% and at a record high annual average, as political tensions in Opec member states help negate a global economic slowdown that has dampened oil demand growth. The immediate focus remains on Iran after Tehran again threatened to block traffic through the Strait of Hormuz, a crucial passage for Middle Eastern crude suppliers after the European Union’s decision to tighten sanctions on Iran over its nuclear programme. The United States said it would preserve oil shipments in the Gulf. Gold is still down 19% from the year’s peak touched in September, as euro zone worries drove investors towards the dollar, making it expensive for holders of other currencies. Next year will continue to be dominated by worries over economic growth and sovereign debt, gold analysts say.